Horses in the wild are known to graze for up to 16 hours a day! A horse’s digestive system is designed to deal with large amounts of forage, either grass or hay, eaten slowly over a long period of time. Hay makes up the largest part of a horse’s diet, so it is important to make sure you always have plenty of hay on hand to feed the horses in your care. Imagine you are in charge of an eight horse barn. The horses are all average sized and get the same amount of exercise each day. To make things easy for you, they eat the same amount of hay each day as well. It is summer and time to order in more hay. How much should you order? Let’s play around with ratios to find out. 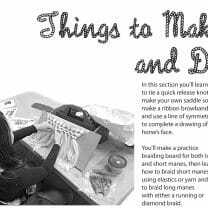 Math Talk – ratio: A ratio shows the relative sizes or amounts of two or more values. It may be written as 3 : 4 (read as ‘3 to 4’) or as a fraction 3/4. 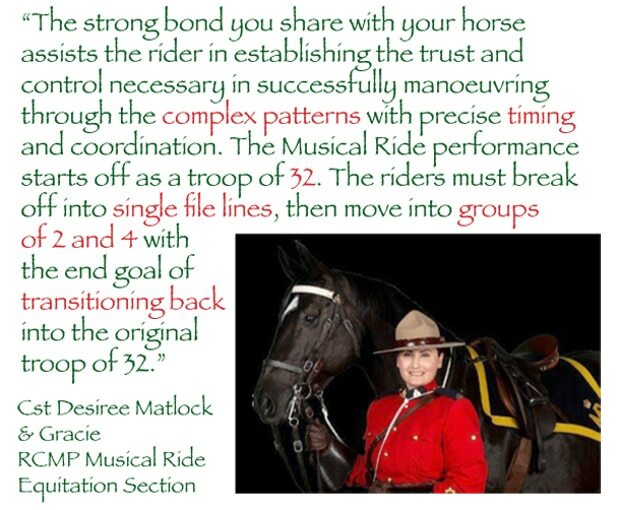 The two values we are going to look at in this post are the number of horses and the number of bales of hay. An average sized horse weighing 500 kg (1100 lbs) horse eats approximately 5 kg (12 lbs) of hay each day. 1. If 1 bale of hay weighs 60 lbs, how many days worth of hay will you get from one bale for one horse? The graphic to the left shows the relationship between one horse and how many bales of hay it eats every 10 days. This relationship can be written as the ratio, 1/2. For every additional horse in the barn, the ratio of the number of bales per horse remains the same. Let’s apply what we know and begin increasing the number of horses, after all – you’ve got 8 horses to feed! 2. For two horses, how many bales of hay would you need every ten days? 3. Write this as a ratio. 4. How many bales of hay would you need for 4 horses every ten days? 5. Write this as a ratio. 7. How many bales of hay will you need for all the 8 horses at your barn for 10 days? You decide you want to buy enough hay to feed the horses for 60 days and find a local farmer selling good quality grass hay for $7 per bale. 8. How many bales would you buy? 9. How much would the hay cost? Express your answer in word form. You pay the farmer with 7 $100 bills. 10. How much change do you get back? The hay arrives looking wonderful, and the smell – there are few things that smell better than fresh cut hay! Your boarders are grateful for the job you’ve done and the horses nicker eagerly as you toss flakes of hay into their stalls. 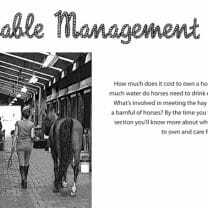 Managing a barn and looking after horses requires many different kinds of skills. One of them is being good at math! 1. A 500 kg horse eats about 5 kg (12 lbs) of hay each day. If 1 bale of hay weighs 60 lbs, how many days worth of hay will you get from one bale for one horse? Answer: 60 ÷ 12 = 5. You will get 5 days worth of hay from one bale. Answer: 2 x 2 = 4. You would need 4 bales of hay. Answer: 4 x 2 = 8. 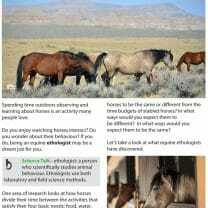 You would need 8 bales of hay to feed 4 horses for 10 days. Answer: The three ratios are 1/2, 2/4 and 4/8. The first one, 1/2 cannot be simplified any further. 2/4 simplifies to 1/2. 4/8 simplifies to 1/2. All the ratios are the same! 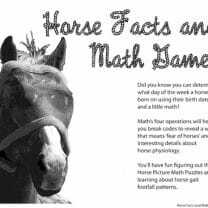 No matter how high the number of horses, you will need twice as many bales of hay as there are horses every ten days. Answer: 8 x 2 = 16. You would need 16 bales of hay every 10 days. Step 1: 60 ÷ 10 = 6. There are 6 ten day sections in 60 days. Step 2: 6 x 16 = 96. You would buy 96 bales of hay. 9. How much would the hay cost? Express you answer in word form. Answer: 96 x 7 = 672. The hay would cost six hundred and seventy-two dollars. Answer: 700 – 672 = 28. You would get back $28. Real life math, I love it! The biggest complaint I heard from kids who didn’t like math when I was in school was “It’s not like we’re going to use this in real life.” This would be great for those kids. This will help me in a court case. Thanks!! I’d love to know how you’ll use this post to help in a court case. Can you explain further? I’m intrigued!